After spending eight years playing detective Saga Norén in The Bridge, Swedish actor Sofia Helin’s next screen role will see her portray a princess fighting for her country during the Second World War. She tells DQ about finding her voice and playing a royal in Atlantic Crossing. With the recent centenary of the armistice that brought an end to the First World War and the #MeToo campaign that is giving a voice to women around the world, there could not be a more pertinent time to tell the story of Atlantic Crossing. The eight-part drama, based on a true story, charts Norwegian Crown Princess Märtha’s efforts to support her country during the Second World War. In April 1940, when Norway finds itself under attack from the Nazis, Märtha and her husband Olav are forced to separate. He flees to England with his father, the king, while Märtha and their three children, unable to return to Sweden, the place of her birth, undertake the hazardous journey across the Atlantic Ocean to seek refuge in the US at the invitation of President Franklin D Roosevelt (played by Twin Peaks star Kyle Maclachlan). Märtha soon realises the president is in love with her, sparking gossip on both sides of the sea. 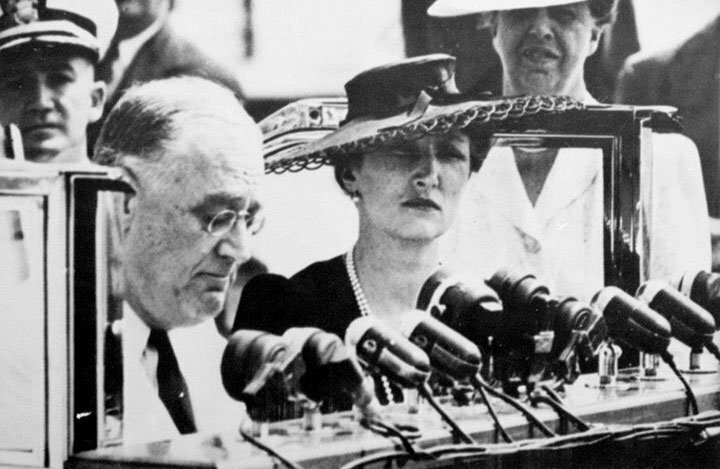 But at a time when the US is unwilling to join the war, she uses her position to influence Roosevelt and enter the political scene. Meanwhile, the drama also follows Olav, terrified of a Nazi conspiracy against his family and concerned by rumours of an affair between his wife and the US president. Will Märtha fight for her country or her marriage? The NRK series, produced by Cinenord Drama and distributed by Beta Film, sees Märtha played by Sofia Helin, the Swedish actor who earned plaudits around the world for starring as Saga Norén in all four seasons of iconic Swedish/Danish crime drama Bron/Broen (The Bridge). With rehearsals taking place in Oslo, filming for Atlantic Crossing began in Prague last December. Speaking to DQ from her home in Stockholm, Helin says the drama is “a very important story about a forgotten female hero,” whose role in the war effort was far greater than first thought. “It’s also a story about a person who finds her own voice,” she continues, noting the drama’s similarities to her own life over the past 18 months as she has taken a leading role in Sweden’s MeToo movement, #tystnadtagning. In November 2017, more than 700 actors signed a manifesto calling for a change in the behaviour within the country’s film and television business, with similar protests springing up around other industries, including the legal, medical and journalism sectors. Helin has been involved in the series for more than two years, working alongside executive producer Silje Hopland Eik and showrunner-director Alexander Eik to develop the previously untold story of Märtha’s bid to help her country through her relationship with Roosevelt. She was even by his side during his famous Look to Norway speech in September 1942, which is said to have inspired the Norwegian resistance against the German occupation and turned the tide of US public opinion regarding the war in Europe. Meanwhile, Märtha’s own struggle sees her go from royal princess to refugee as she flees her adopted country and heads to America. “She didn’t know if she would see her husband again. He was in London, being bombed by the Germans. Going to the US wasn’t a little thing. It’s quite far away. Then she develops into an active person who fights for her country. That’s quite a journey,” Helin says of her character. After playing Saga in The Bridge, the actor is relishing the opportunity to take on new roles and not be tied to a single production. She was originally set to star in Heder (Honour), a Swedish drama she co-created with fellow actors Alexandra Rapaport, Julia Dufvenius and Anja Lundqvist, but a scheduling clash meant she opted to stick with Atlantic Crossing, though she remains an executive producer on Heder. “The hard thing has been to choose what to do,” Helin says of the new opportunities coming her way. “I have several different projects going on that I’m developing, and I can’t star in everything. There’s only a certain amount of time. But it’s been a very intense and fun time, and there’s also a sense of freedom to not be tied to a production. After eight years [working on The Bridge], it’s about time. Helin believes producers now have a greater understanding of what actors can bring to a project, meaning on-screen personalities are increasingly creating their own series and playing a bigger role in development, rather than simply signing on several weeks before the start of filming. A fan of Netlix drama The Crown, Helin is relishing the chance to play royalty but doesn’t forget the importance of the message the drama is trying to send to viewers. “She sacrificed something for her country,” the actor says of Märtha. “She fought for her country, for freedom, for democracy, for her family and she did something. Not to be greedy as a woman, but it’s so typical that all the men get the medals, the fame and the honour but the women get forgotten. It’s about time we start to tell the stories of women who did something in history.